As part of our contribution to the EU-funded research project, TagitSmart, the EVRYTHNG Labs team have been working on environment-sensitive product tags connected to the Internet of Things. That is: low-cost tags that can record data about the environment they are deployed in. TagitSmart is an EU-funded IoT initiative that’s developing a new technology for ink-based, serializable tags. assign a specific value to a product; a number or URL for example. Once a traditional barcode (1D or 2D) is printed, the data in it, such as a product code or url cannot be changed or updated. 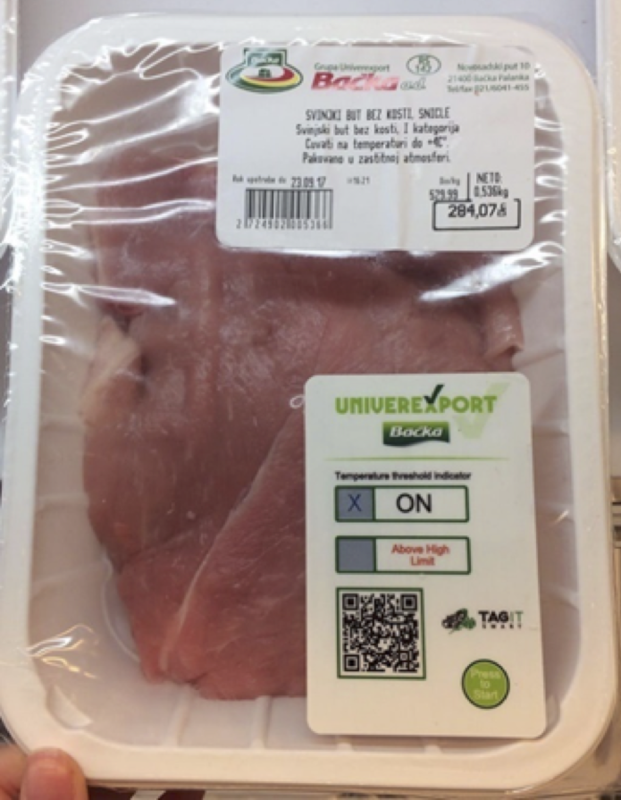 TagItSmart example: Thermochromic ink printed as a QR code. This tag contains two indicators. “ON” indicates that the tag has started measuring, and “Above High Limit” indicates if the temperature limit has been exceeded. In contrast, an environment-sensitive tag is a barcode with values that can automatically change when certain environmental conditions change. These tags will be able to recognize their current and past environmental exposure (such as temperature fluctuation) to update physical products that they are attached to with dynamic digital information. These types of “sensitive” barcodes are not new. For example, these technologies are already being used in cold-chain and food-safety applications. What is new, however, is the convergence of environment-sensitive tags with open IoT technologies. Item-level identification of each physical and digital object is at the core of the IoT and environment-sensitive tags. Being able to put information into context is powerful. The more that is known about an object’s physical context, such as its environment, the more useful the object becomes to decision makers when analyzing products and business processes. If this sounds a bit abstract, let us look at two use cases — supply chain visibility and brand protection — to develop an understanding for when environment-sensitive tags could be used. 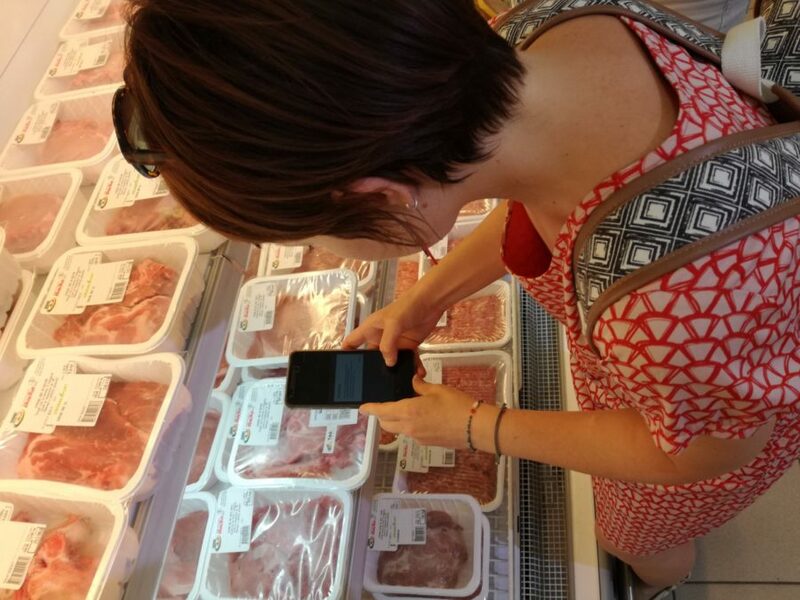 Item-level supply-chain visibility is needed to monitor cold-chains for food-safety and ‘keepability’, to ensure that consumers are only being sold food that is safe for consumption. With growing focus on food waste, this is a booming area – according to Supply Quarterly¹, the market for cold chain monitoring is expected to reach $6.2 billion by 2022. It’s also necessary in healthcare to make sure drugs are being kept within a specific temperature range during transportation and storage. Despite high-tech anti-counterfeit measures, counterfeiting is still on the rise. The Economist² quote a 2016 OECD³ report that fake goods account for 2.5% of all global trade, a total of $461 billion. And counterfeiters aren’t just harming the perfume and apparel industries. Increasingly, counterfeiters have begun to target pharmaceuticals, plane parts, children’s toys, and beverages. Through their actions, counterfeiters are introducing products to the market that are unsafe and potentially pose a risk to people’s lives. Environment-sensitive tags provide the basis to build product passports — labels that provide a certificate of authenticity by storing the “fingerprint” of each product which is a combination of digital data in the cloud with local data about the product’s interactions with the physical environment. They can visibly change when a product expires or can show the environmental conditions a product was stored in, making tampering much more difficult. Like your personal passport, a product passport will allow you to verify the authenticity of each and every product in a tamper-proof manner by combing physical properties that make them hard to copy and by leaving a digital trace that a counterfeiter cannot replicate. The collective histories of similar products also opens up the possibility of using machine learning algorithms for fraud detection. The combination of physical and digital information therefore makes it harder and considerably more expensive, for counterfeits to copy products. To wrap up, environment-sensitive tags, as proposed by TagItSmart, combined with identifiers that are connected to the Web through an IoT platform such as EVRYTHNG, have the potential to address customer needs. We focused on specific use cases in this blog, but others will rapidly emerge too. Transparency, authenticity and visibility have always proved difficult for manufacturers, but the technology is there now to make these things considerably easier.